One very important part of user configuration at the end of the installation process is to tell PSI4 where to write its temporary (“scratch”) files. Electronic structure packages like PSI4 can create rather large temporary disk files. It is very important to ensure that PSI4 is writing its temporary files to a disk drive physically attached to the computer running the computation. If it is not, it will significantly slow down the program and the network. By default, PSI4 will write temporary files to /tmp, but this directory is often not large enough for typical computations. Therefore, you need to (a) make sure there is a sufficiently large directory on a locally attached disk drive (100GB–1TB or more, depending on the size of the molecules to be studied) and (b) tell PSI4 the path to this directory. Scratch file location can be specified through the PSI_SCRATCH environment variable or through the ~/.psi4rc file (see section ~/.psi4rc File). Most of the time, PSI_SCRATCH is preferred, and it overrides any existing ~/.psi4rc setting. You can set up PSI_SCRATCH by issuing the following commands in a terminal, or including them in the appropriate rc file. PSI4 has a number of utilities that manage input and output (I/O) of quantities to and from the hard disk. Most quantities, such as molecular integrals, are intermediates that are not of interest to the user and can be deleted after the computation finishes, but pertinent details of computations are also written to a checkpoint file and might be useful in subsequent computations. All files are written to the designated scratch numbered by content and labeled with the process id, then are deleted at the end of the computation, unless otherwise instructed by the user. Note that the restart_file options is only available for energy procedures as of now. It is very easy to forget about the ~/.psi4rc file you once created, leading to great confusion over why all your jobs are using the wrong memory or are suddenly not density-fit. Also be aware that ~/.psi4rc contents count as part of your input file (invoked after e.g. from psi4 import * and before your Psithon–>Python parsed input commands), so these settings take priority over command-line arguments to the psi4 executable. Please use the ~/.psi4rc file conscientiously. If using the environment variable PSI_SCRATCH is inconvenient, or if some psi4_io commands must be present in all input files, the ~/.psi4rc resource file can be used (example psi4/samples/example_psi4rc_file). All the commands mentioned in section Scratch Files and Elementary Restart can be used in this file. The Python interpreter will execute the contents of the ~/.psi4rc file in the current user’s home area (if present) before performing any tasks in the input file. As a consequence, the commands in the input files supersede any instructions in the ~/.psi4rc file. During execution, the ~/.psi4rc defaults will be loaded in first, but then the commands in the input file will be executed. The ~/.psi4rc file can also be used to define constants that are accessible in input files or to place any Python statements that should be executed with every PSI4 instance. Most new modules in PSI4 are designed to run efficiently on SMP architectures via application of several thread models. The de facto standard for PSI4 involves using threaded BLAS/LAPACK (particularly Intel’s excellent MKL package) for most tensor-like operations, OpenMP for more general operations, and C++ std::thread for some special-case operations. Note: Using OpenMP alone is a really bad idea. The developers make little to no effort to explicitly parallelize operations which are already easily threaded by MKL or other threaded BLAS. Less than 20% of the threaded code in PSI4 uses OpenMP, the rest is handled by parallel DGEMM and other library routines. From this point forward, it is assumed that you have compiled PSI4 with OpenMP and MKL (Note that it is possible to use g++ or another compiler and yet still link against MKL). Control of threading in PSI4 can be accomplished at a variety of levels, ranging from global environment variables to direct control of thread count in the input file, to even directives specific to each model. This hierarchy is explained below. Note that each deeper level trumps all previous levels. Deprecated since version 1.1: Environment variables OMP_NUM_THREADS and MKL_NUM_THREADS do not affect threading in PSI4. which will run on four threads. Note that is is not available for PsiAPI mode of operation. In PsiAPI mode of operation, this syntax, psi4.set_num_threads(nthread), is the primary way to control threading. to explicitly control the number of threads used for integral formation. Setting this variable to 0 (the default) uses the number of threads specified by the set_num_threads() Psithon method or the default environmental variables. To run a PSI4 job on a PBS queueing system, you need to properly set up all necessary variables in the PBS job file. Below is a minimal example of a PBS job file for a threaded job, and a short explanation for each section. if ! ( $?PSIPATH ) setenv PSIPATH ""
The PBS -j oe option instructs PBS to write any output or error message from the queuing system in dedicated files. PBS -l pmem=2120mb requests 2120 MB of memory for each thread on the node. The total memory requested for the job by PBS should generally be slightly greater than what indicated in the input file (see memory setting). Then, we move to the working directory using PBS variable $PBS_O_WORKDIR and we create scratch directories on every node, using the $PBS_NODEFILE which points to a file containing a list of the nodes attributed to the job. Note again that the specific commands for your PBS system may differ. Refer to your system administrator. PSI4 can be invoked with no command line arguments, as it takes as input by default the file “input.dat” and directs output by default to “output.dat”. The set of three commands below are completely equivalent, while the fourth is, perhaps, the most common usage. Command-line arguments to PSI4 can be accessed through psi4 --help. Display the command-line options and usage information. Skips input preprocessing. Expert mode. Leave temporary files after the run is completed. These environment variables will influence PSI4’s behavior. Number of threads to use by operations with Intel threaded BLAS libraries. Do access nested DGEMM in OpenMP sections in DFMP2 for multi-socket platforms. This is very low-level access to OpenMP functions for experienced programmers. Users should leave this variable unset or set to False. Number of threads to use by modules with OpenMP threading. Configuring PSI4 through PSIPATH is preferred to modifying this environment variable. To run Kállay’s MRCC program (see MRCC), the dmrcc executable must be in PATH. Likewise to run Grimme’s dftd3 program (see dftd3), the dftd3 executable must be in PATH. Directory where scratch files are written. Overrides settings in ~/.psi4rc. It is very important to ensure that PSI4 is writing its scratch files to a disk drive physically attached to the computer running the computation. If it is not, it will significantly slow down the program and the network. Path in which PSI4 looks for user extensions to the built-in libraries. Specifically, directories containing user basis sets, EFP fragments, databases, plugins, and interfaced executables ( dmrcc for MRCC and dftd3 for DFTD3 ) should be placed in this colon-separated list. 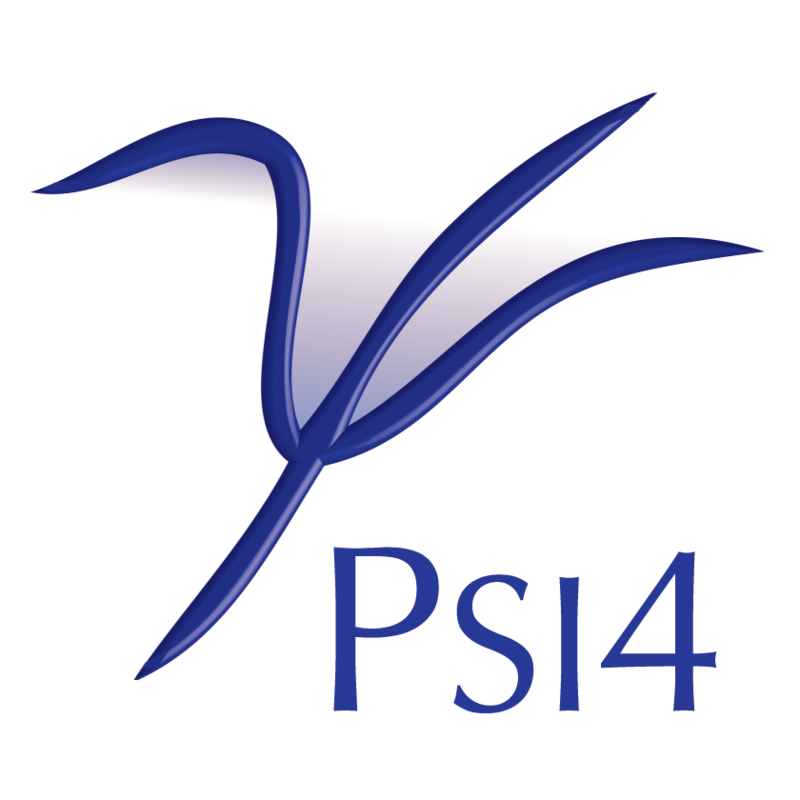 PSI4 is designed so that user extensions that are findable through PSIPATH can be used in input files entirely like their built-in counterparts, without additional tagging as non-standard. The typical search path is first the built-in libraries, next each PSIPATH directory in order, and finally the execution directory (I won’t swear everything tacks on the execution directory). Path in which the Python interpreter looks for modules to import. For PSI4, these are generally plugins or databases. Modification of PYTHONPATH can be done in three ways, equivalently. Place the path in the ~/.psi4rc file so that it is available for every PSI4 instance. Place the path in the input file, either absolute or relative. Path in which the PSI4 executable looks for its non-compiled dependencies (i.e., basis sets, databases, quadratures, etc.). This path is always known by the PSI4 program or shared library, so this variable is relevant primarily to developers wanting a non-standard location. Value should be set to directory containing driver, basis, etc. directories, generally ending in share/psi4.